Meet you local coppers in Brownhills this morning! Meet your local police drone team at Brownhills this morning! 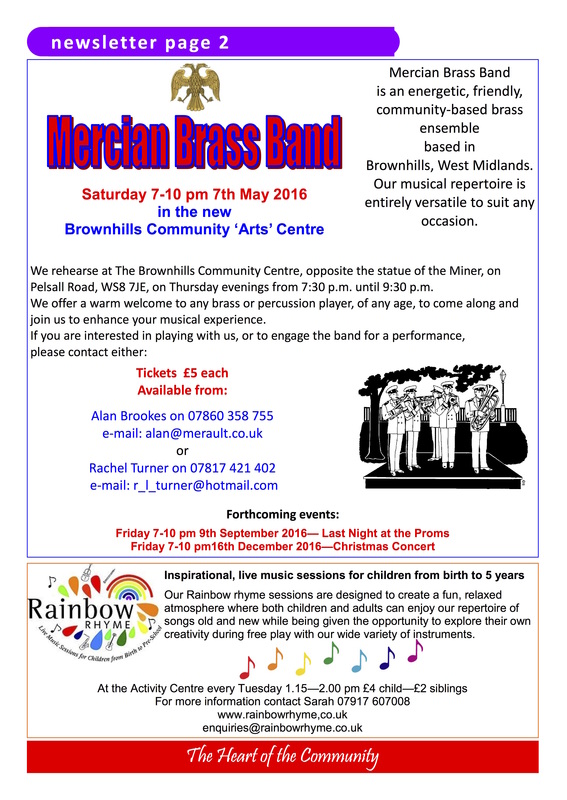 Well, what do you know – just as I published the advert for the police pop-up event taking place at Tesco today (Friday 23rd March 2018), another email dropped into my inbox from the excellent WMNow service pointing out there there are actually four separate events today – one each in Brownhills, Shelfield, Pelsall and Rushall. 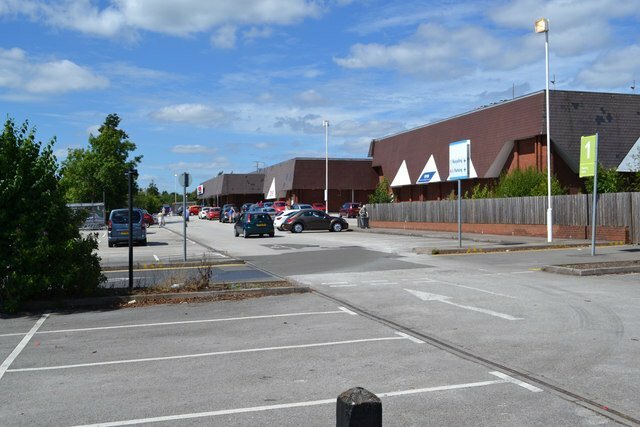 I received notice of this great event from Brownhills Policing Team via the excellent WMNow service a yesterday, advertising a pop-up meet the police event this coming Monday afternoon, 26th February 2018 at Tesco, Brownhills from 3pm until 5pm where you can meet your local policing team and get help, crime prevention and public safety advice. 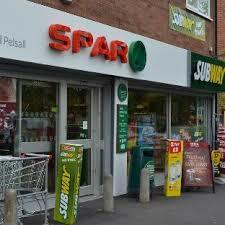 Meet your local coppers in Pelsall and Rushall! I received notice of another couple of useful ‘Meet the public’ popup events via the excellent WMNow service yesterday – both this coming Friday in Pelsall and Rushall – these are great initiatives where you can meet your local policing team and get help, crime prevention and public safety advice. I received notice of this great event from Brownhills Policing Team via the excellent WMNow service a yesterday, advertising a pop-up meet the police event this afternoon, Friday 17th November 2017 at Tesco, Brownhills from 3pm until 6pm where you can meet your local policing team and get help, crime prevention and public safety advice. I received notice of this great event from Brownhills Policing Team via the excellent WMNow service a few days ago, advertising a pop-up meet the police event this Saturday, 21st October 2017 at Tesco, Brownhills from 3pm until 5pm where you can meet your local policing team and get help, crime prevention and public safety advice. I received notice of another couple of useful late afternoon ‘Meet the public’ popup events via the excellent WMNow service a few days ago – one this coming Friday in Pelsall and another on Saturday in Rushall – these are great initiatives where you can meet your local policing team and get help, crime prevention and public safety advice. 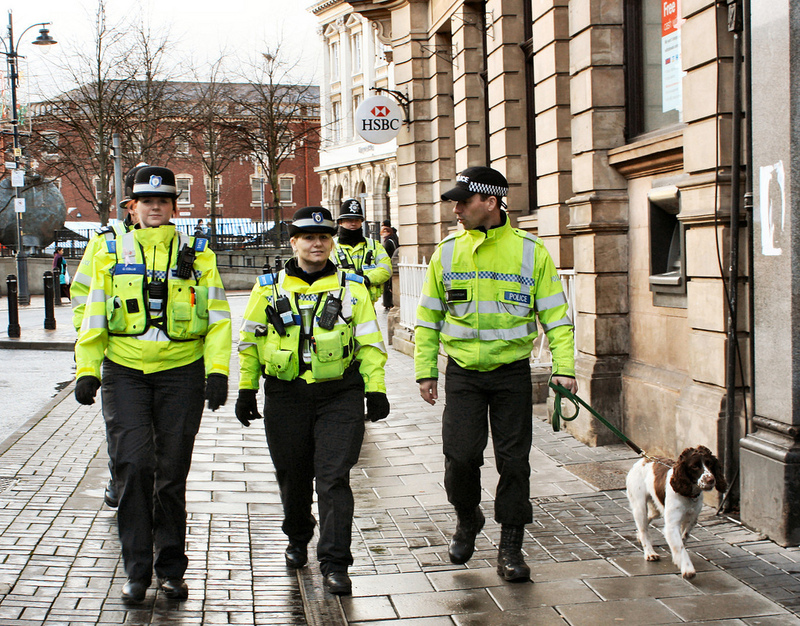 I received notice of another couple of useful ‘Meet the public’ popup events via the excellent WMNow service a few days ago – one tonight in Pelsall and another tomorrow in Rushall – these are great initiatives where you can meet your local policing team and get help, crime prevention and public safety advice. I received notice of this great event from Walsall Police via the excellent WMNow service a few days ago, advertising a pop-up meet the police event this Saturday, 24th June 2017 at Pelsall Library from 10am until 12 noon where you can meet your local policing team and get help, crime prevention and public safety advice. 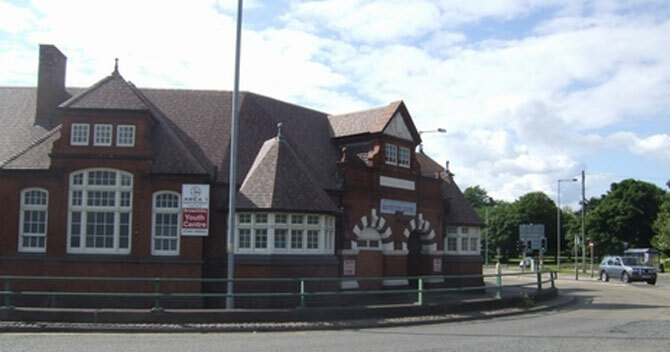 A great local history legend at Walsall Wood Library soon ! 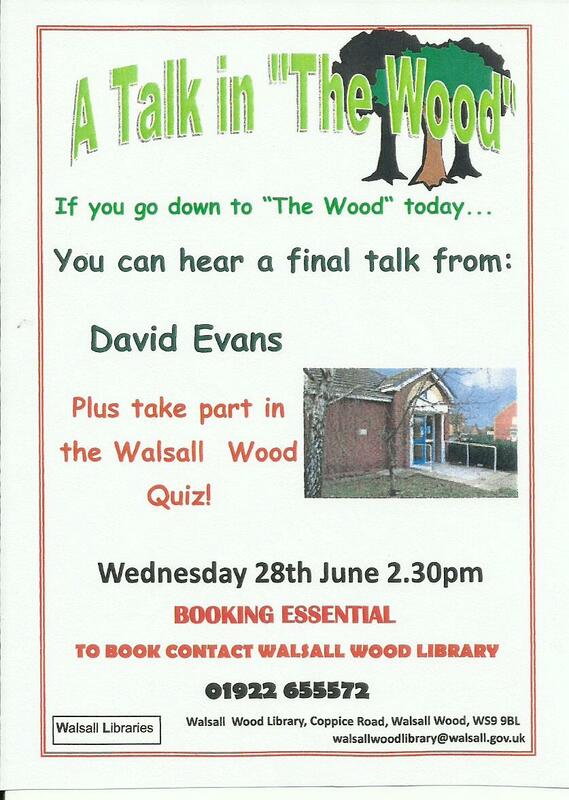 Just a quick headsup to those interested in Walsall Wood history and who are free on the Wednesday afternoon of 28th June 2017 – there’s a talk featuring the Brownhills Blog’s favourite Wood Mon™ and top contributor, the young David Evans. If you didn’t know it, you can meet a Poet at Brownhills Library this Wednesday! This Wednesday, 24th May 2017 it’ll be a rather special day at Brownhills Library in the Parkview Centre as Brownhills adopts its own poet for a day! Over 50s employment support event at Brownhills Library this morning! 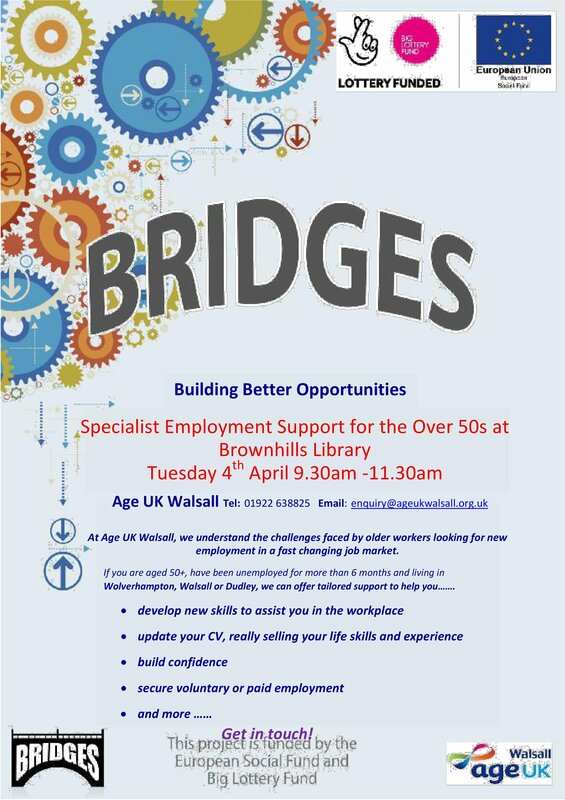 A bit late I know, but might catch a few of you at least: There’s a specialist over 50s employment support/information event happening TOADY 4th April 2017 at Brownhills Library (Tuesday 4th April 2017), from 9:30-11:30am. 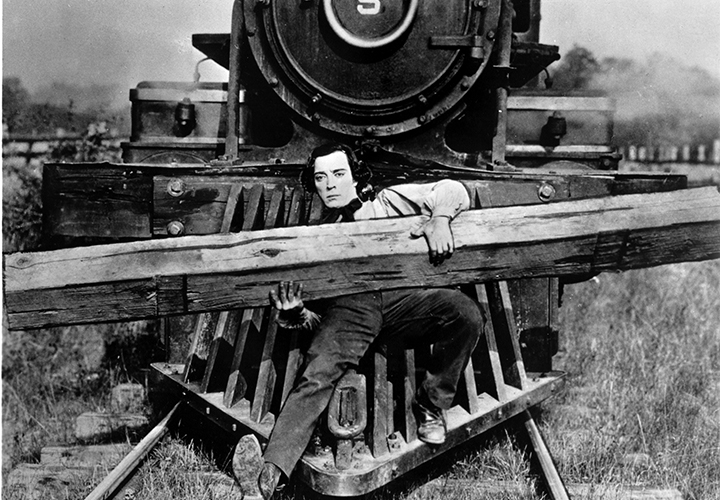 Don’t miss Back to Backs – another brilliant Talk in the Wood! Don’t miss your opportunity to attend another fascinating local history talk at Walsall Wood Library this Wednesday, 15th March 2017, when Birmingham Historian and National Trust Guide Clive Katz will be discussing the subject of the Birmingham Back to Backs. Don’t forget – chance to catch a local legend this Wednesday! 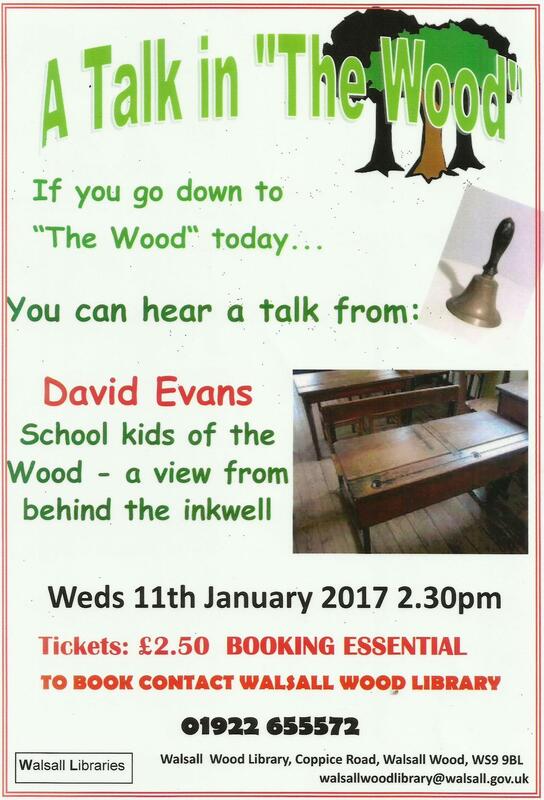 Just a quick headsup to those interested in Walsall Wood history and who are free on the Wednesday afternoon of 11th January 2017 – there’s a talk featuring the Brownhills Blog’s favourite Wood Mon™ and top contributor, the young David Evans. Your second chance to catch a Walsall Wood legend in action – not to be missed. 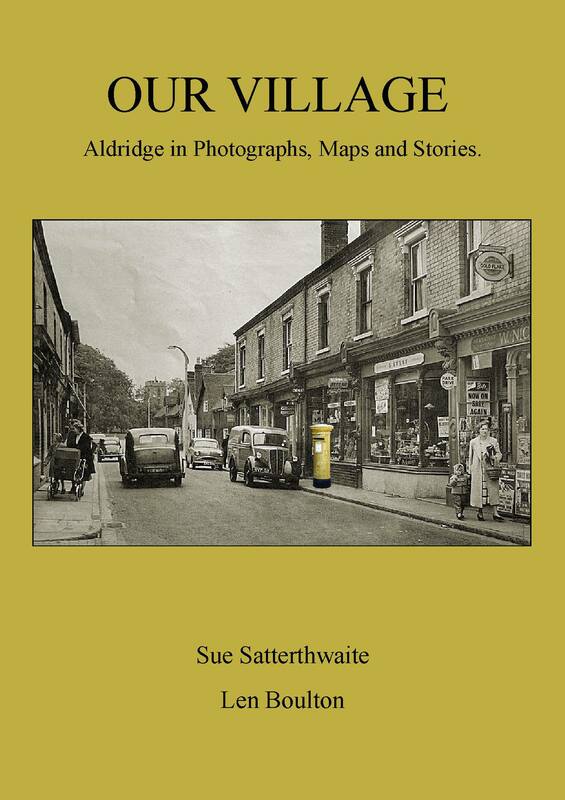 Our Village – a great new local history book for Aldridge – out now and selling fast! There are a handful of great local history books out at the moment, just in time for Christmas, that would makes great gifts for those with a local interest – last week I noted the new book on Brownhills pubs by Clive Roberts, and I’m posting today to point up the new book by Sue Satterthwaite and Len Boulton covering Aldridge. 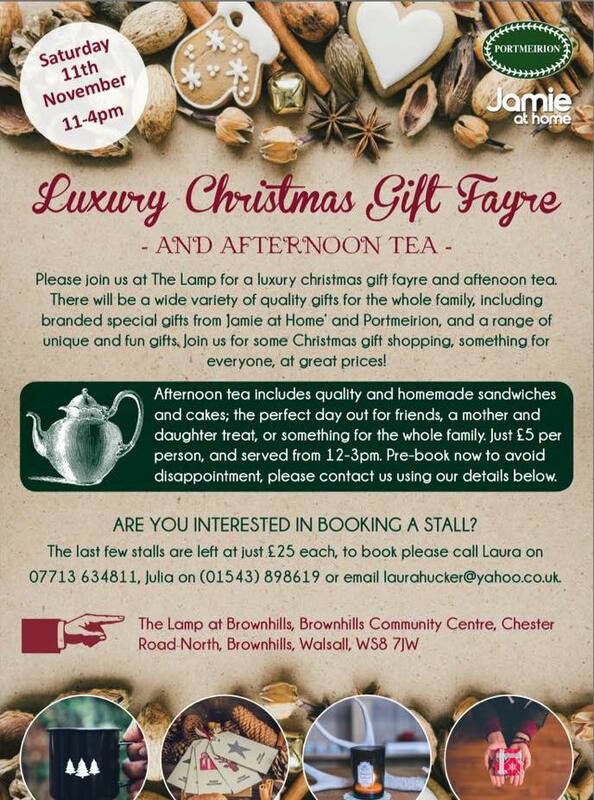 Flying high at the Lamp – this Saturday! 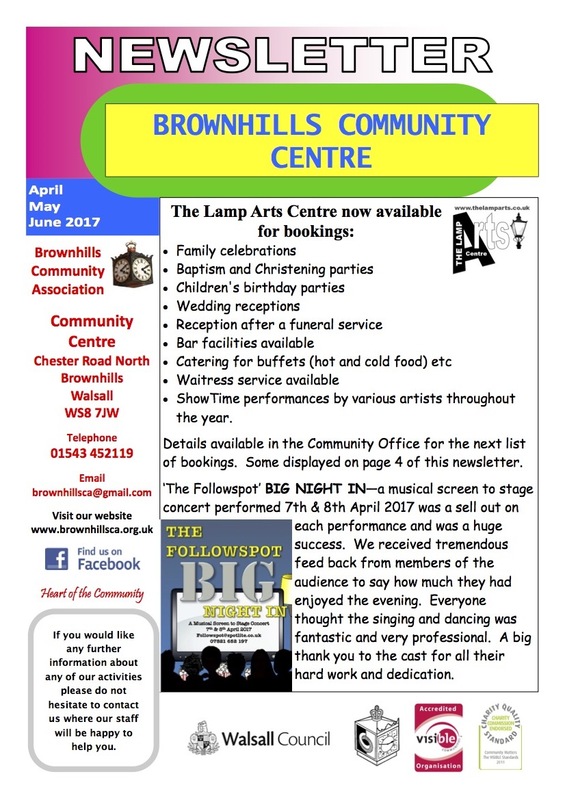 Brownhills Community Association have been busy, and recently got in touch to point out that they have a great live comedy act this weekend in The Lamp, their new arts and performance space. 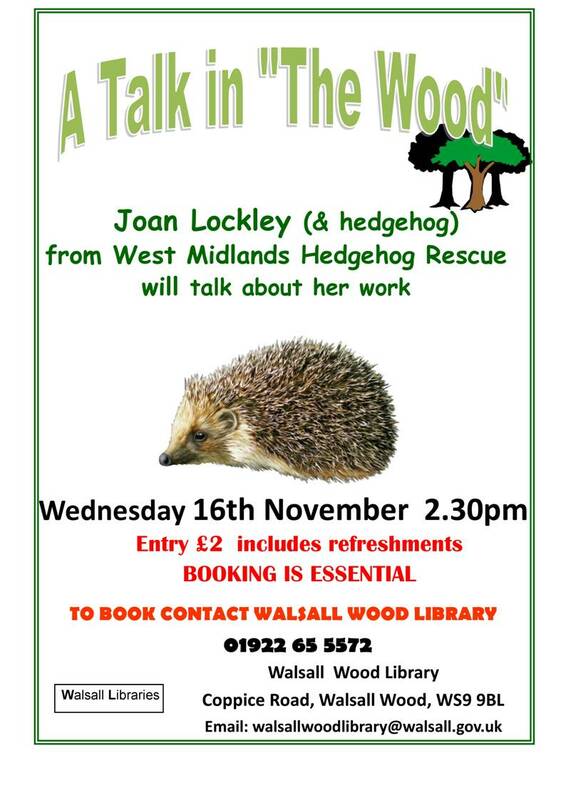 Don’t miss your opportunity to attend another fascinating talk at Walsall Wood Library this Wednesday, 16th November 2016, when remarkable hedgehog rescuer and champion Joan Lockley will be discussing her work – and bringing along a spiky guest for you to meet! Don’t miss your opportunity to attend another fascinating local history talk at Walsall Wood Library this Wednesday, 19th October 2016, when local historian Ethel Lote will be discussing the subject of war weddings. Don’t miss War Weddings – another brilliant Talk in the Wood! 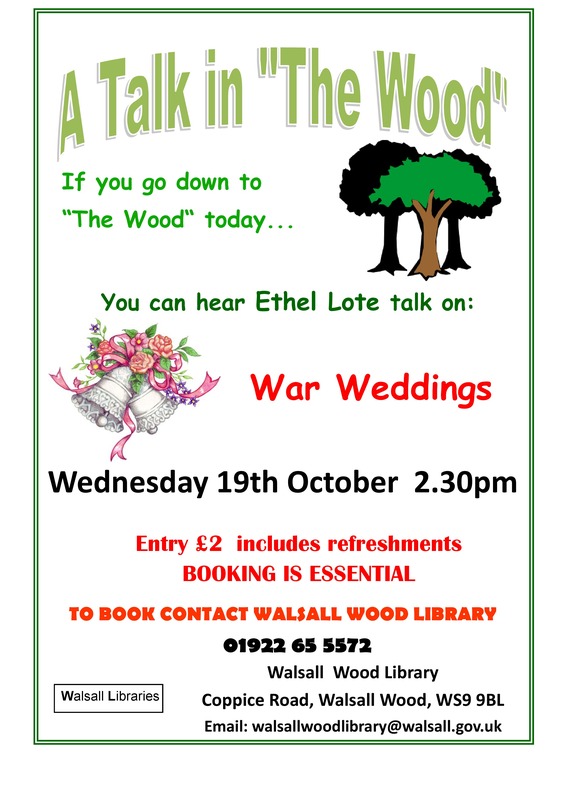 Don’t miss your opportunity to attend another fascinating local history talk at Walsall Wood Library next Wednesday, 19th October 2016, when local historical Ethel Note will be discussing the subject of war weddings. Your chance to catch a local legend – this Wednesday afternoon! 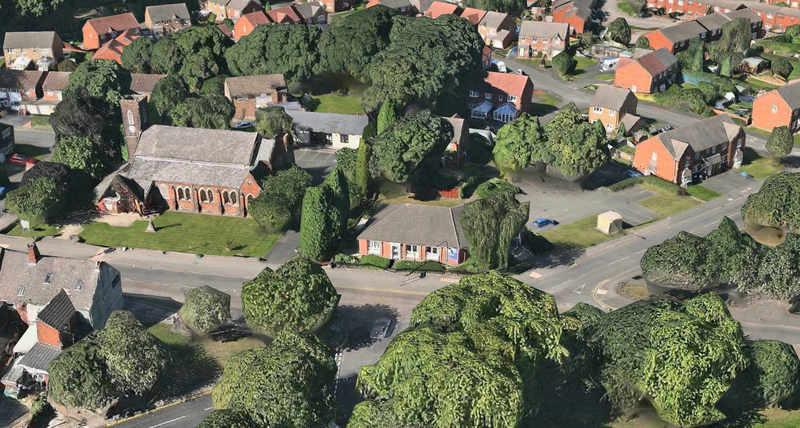 Just a quick headsup to those interested in Walsall Wood history and who are free this Wednesday afternoon (28th September 2016) – there’s a talk featuring the Brownhills Blog’s favourite Wood Mon™ and top contributor, the young David Evans. 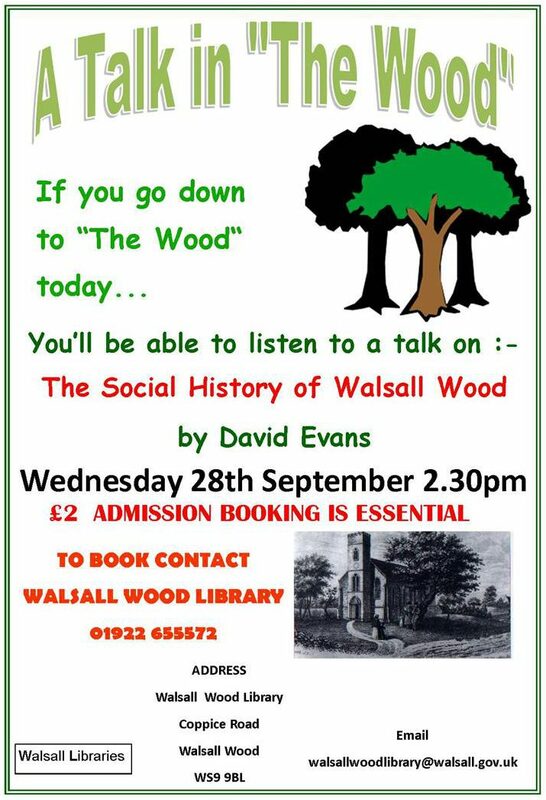 Just a quick headsup to those interested in Walsall Wood history and who are free next Wednesday afternoon (28th September 2016) – there’s a talk featuring the Brownhills Blog’s favourite Wood Mon™ and top contributor, the young David Evans. 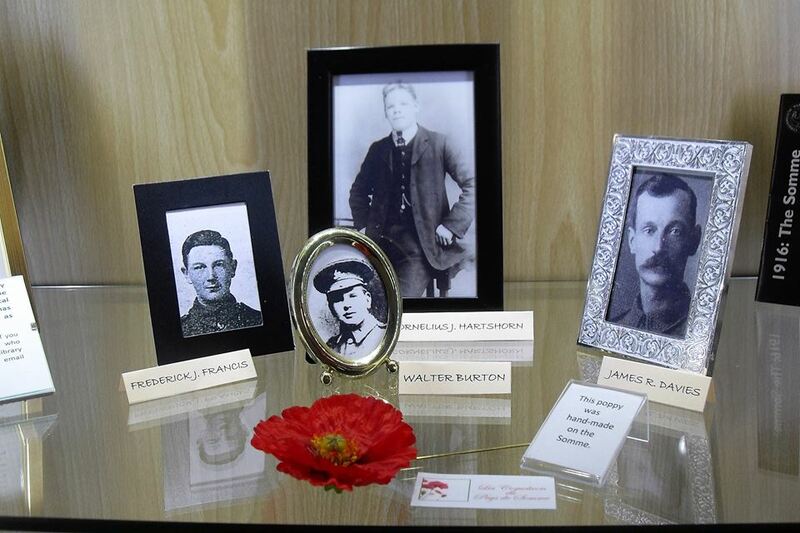 There is a vey interesting pair of Great War Remembrance events coming to Aldridge in a couple of weeks for people who wish to pay respects, those who had family involvement or perhaps historical interest in the Battle of the Somme. 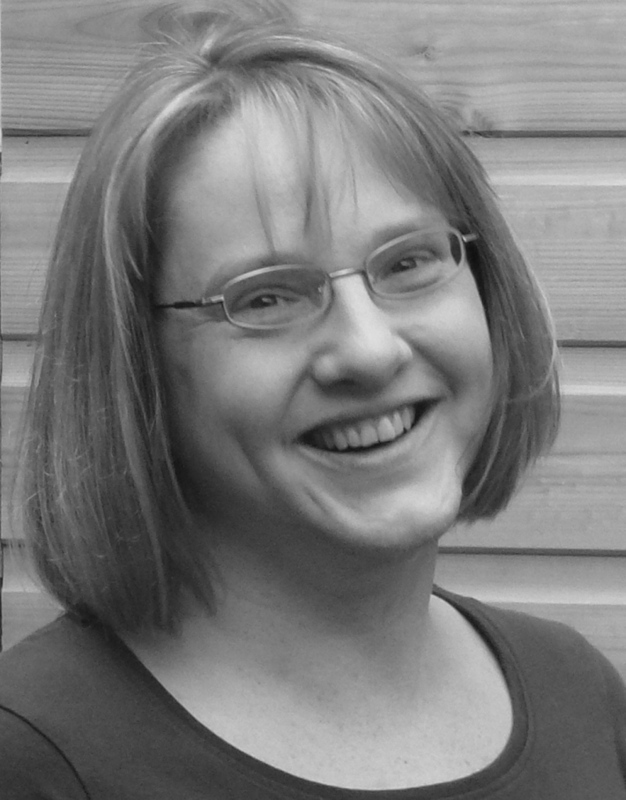 Top author and Crime Scene Investigator to give free talk at Brownhills Library this afternoon! 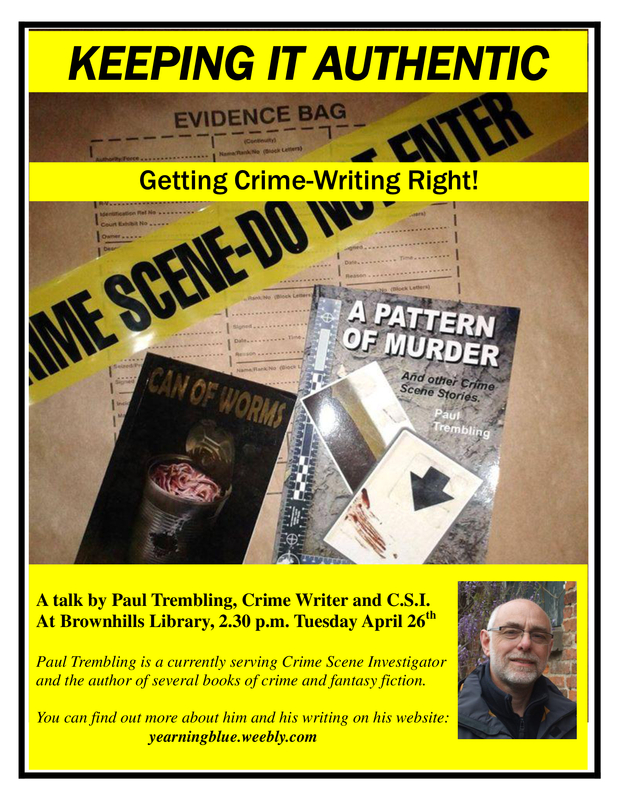 Naomi Jones, Area Librarian from Brownhills Library at the Parkview Centre has been in touch to point out they that have a great talk this afternoon (Tuesday, 26th April 2016) from 2:30pm by noted author and Crime Scene Investigator, Paul Trembling. 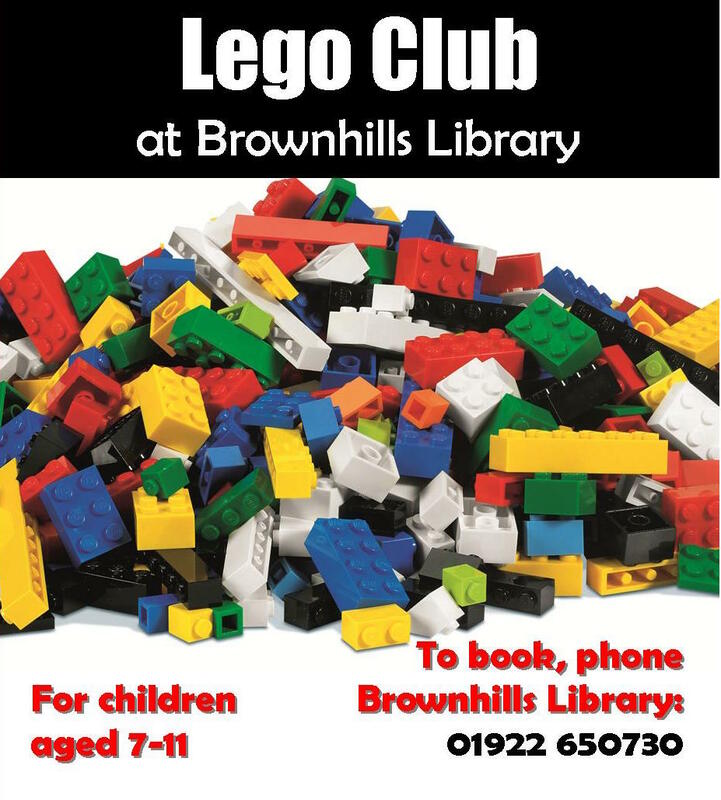 Free Kids Lego Club at Brownhills Library this Saturday morning! Naomi Jones, Area Librarian from Brownhills Library at the Parkview Centre has been in touch to ask if I could give a plug for their kids Lego club this Saturday, 2nd April 2016.